‘Logan: Shattered Memories’ is a proposed six-issue miniseries chronicling Logan’s days just after Barry Windsor-Smith’s ‘Weapon X’. When the Fantastic Four first appeared, they made headlines around the world. What didn’t make headlines was the story of a man discovered in the Canadian wilderness. A man with uncanny animal-like senses and a healing factor that made him nearly indestructible. Taking place just after the events of Barry Windsor-Smith’s classic ‘Weapon X’, ‘Logan: Shattered Memories’ chronicles Logan’s early days as he struggles to deal with his severe amnesia, dangerous berserker rages and an adamantium skeleton and claws that has turned him into the perfect killing machine. 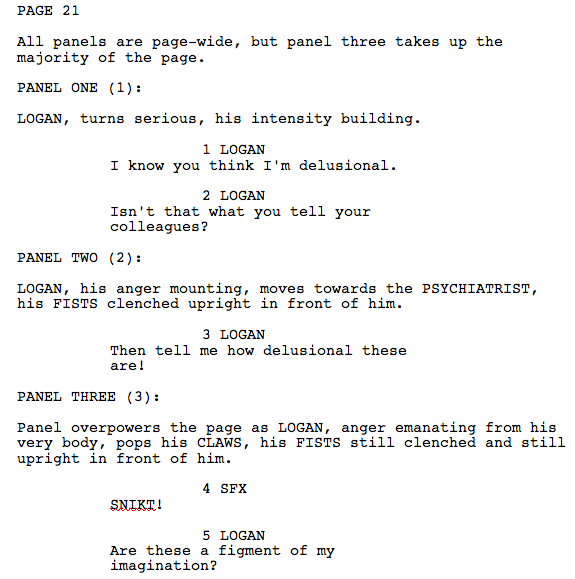 I read the ‘Logan: Shattered Memories’ script you sent and I was blown away, I thought it was one of the best scripts/stories I’ve ever read. It was incredibly strong; it had a way of mixing all of the elements needed for a great comic. You have a very good sense of visuals too. I think you really did a good job with a therapy session mixed with an emotional Wolverine, I never thought he could be written as vulnerable but done in a way that explains his gruffness. I can see a few artists who would be ideal for it, and I think John Cassaday or Butch Guice would be great, at least of professional guys out there. I did want to say that I enjoy how your script is a mix of detailed panel descriptions and emotional beats of a panel. Often the scripts I’ve seen just focus on action or description of what to see not really what the emotional impact needs to be and let the artist make it happen. I think this would make a hell of a Marvel comic; it really needs to be made because the stuff I keep seeing is ok but not this good. ‘Wolverine: Shattered Memories’ #1 – “Key to the Past” – does a phenomenal job at giving the fans the true Wolverine. The script is both intelligent and witty, giving the reader snap shots into Logan’s long tragic past. Both long time readers and new fanboys can enjoy what Joel DiGiacomo delivers in terms of action and plot development. I honestly can’t wait to read more of what Joel has planned, I’m keeping my fingers crossed for this title to be picked up by soon. I absolutely loved part one of ‘Shattered Memories.’ It begins to address an important period in Logan’s life that seems to have been given little attention by writers associated with this character over the years. I would love to see how you spin this out, but even more I would love to see this. The kaleidoscope sequence is very evocative of Logan’s previous experiences and is a creative device that any artist would love to render. Your writing is very visual, and from your descriptions of the panels, I can almost see it. 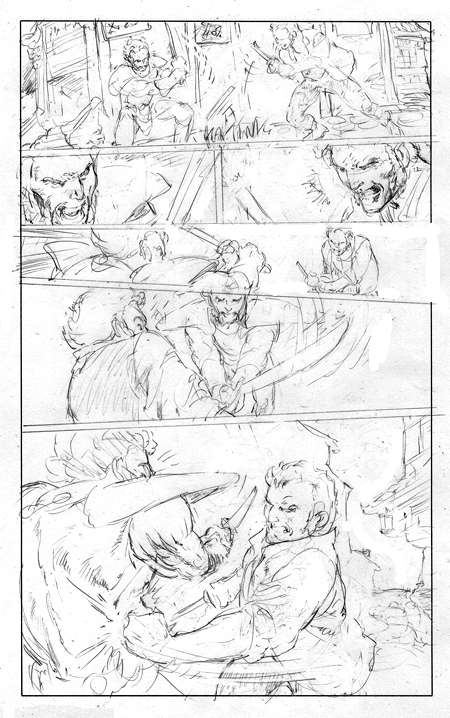 The fight sequence brings to mind the fight panels Miller drew for Claremont so long ago. You have set this up beautifully. This is a gripping character-driven story so far, with an intriguing plot building as we go along. I can’t wait for the next “issue”. If only Marvel would scoop this up, this has the potential to be a seminal Wolverine story along the lines of ‘Weapon X’ and the first Wolverine limited series. A truly fantastic script. I’ve also written another script, ‘Wolverine: Guilt”, that can be previewed here. 2 Comments on "‘Logan: Shattered Memories’"
DiG, Love it…Love it…LOVE IT!!! I would most certainly love to see you taken up by Marvel to get this terrific story published! I definitely would like to see this get published and illustrated. This is a very rare story from Logan’s history that is hardly ever explored. If anybody at Marvel is listening, please make this happen!